This image of wildfires throughout the western United States was collected by the Moderate Resolution Imaging Spectroradiometer (MODIS) aboard NASA’s Aqua satellite on Aug. 23, 2015. Actively burning areas are outlined in red. A new satellite photo captures the wildfires raging throughout the American West, including the biggest conflagration in the history of Washington State. The photo, which was taken Sunday (Aug. 23) by NASA's Earth-observing Aqua satellite, shows just how bad this fire season has gotten in the western United States. 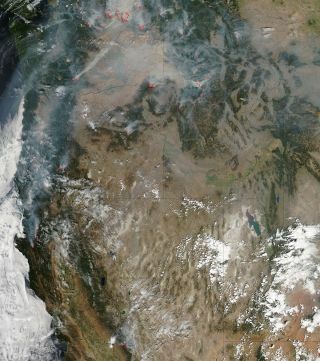 Dozens of active blazes are visible throughout California, Oregon, Washington, Idaho and Montana. The largest fire of them all is the Okanogan Complex burn, which started with a lightning strike on Aug. 15 and has since grown to cover more than 400 square miles (1,036 square kilometers). Three firefighters died last week trying to beat back the blaze. The Aqua satellite has been studying Earth's water cycle with six different instruments since its 2002 launch. The spacecraft snapped the new natural-color image using its Moderate Resolution Imaging Spectroradiometer, or MODIS. MODIS' thermal bands detected actively burning areas, which are colored red in the photo, NASA officials said. Wildfires aren't the only natural disasters Aqua keeps an eye on. The satellite also provides researchers with detailed imagery of hurricanes, such as Super Typhoon Soudelor, which pounded a number of islands throughout the Pacific earlier this month.